Founded in 1974 Jensen Transformers, Inc., is a manufacturer and developer of high performance audio transformers. 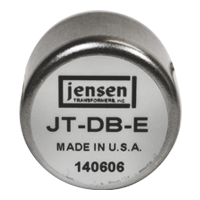 Tens of thousands of Jensen transformers are in use today throughout the world, and maintain a flawless reputation for superior quality and reliability. Deane Jensen, our founder, embarked on a quest in the early ’70’s to unravel the shortcomings of audio transformers. He realized that transformers were often the root cause of “bad” sounding equipment and therefore committed heavily to basic research related to precision and waveform fidelity. Much of this pioneering work focused on audio transformers and their interface with system electronics. At Jensen, we continue today to design transformers having the response of a Bessel low pass filter, which by definition, has virtually no phase distortion, ringing, or waveform overshoot. Core materials are batch tested to meet permeability requirements and laminations are hand-stacked to create the unique design. Ultra-high precision Swiss-made Meteor numeric winders are employed to wind the bobbins and ensure absolute accuracy for transformer-to-transformer consistency. Strict quality controls are maintained over every facet of production from raw materials through final test to ensure that Jensen transformers are the best available. Each transformer is rigorously tested both before and after encapsulation. Full disclosure of test procedures and performance graphs are made public to enable the most demanding engineer to make informed product decisions during the design process. 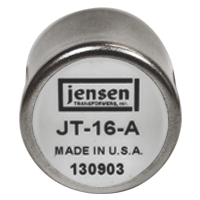 Jensen transformers are available in a variety of standard formats in choice of PC mount or wire lead termination and custom designs are available. Each Jensen Transformer is guaranteed for 20 years and made to deliver the very highest quality signal path with the least amount of distortion and lowest possible noise. Jensen… tried, tested and true. Mic preamps with input transformers enjoy lower noise floor, simple phantom powering, and freedom from hum, buzz & RF interference. Jensen's extended LF and Bessel-tailored HF responses produce time-domain accuracy and sonic transparency. A selection of ratios optimizes solid-state or vacuum-tube gain stages. 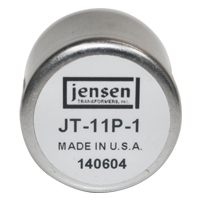 Jensen mic "split" transformers are unique in their use of multiple Faraday shields, giving them extreme immunity to hum, buzz and RF interference. Jensen's extended LF and Bessel-tailored HF responses for time-domain accuracy give them legendary sonic transparency. Available in PC or wire lead in 2, 3, and 4-way models. Faraday shielding allows Jensen line input transformers to reject noise and RF interference far better than "active" inputs in electrically hostile environments. Jensen's extended LF and Bessel- tailored HF responses for time-domain accuracy give them sonic transparency with generous headroom down to 20 Hz. Output transformers have a "universal" ability to interconnect outputs and inputs, regardless if they are balanced or unbalanced. Jensen output transformers excel at driving long cables to extraordinarily high levels, even at 20 Hz, with ultra-low distortion. Various types available for specialized applications. 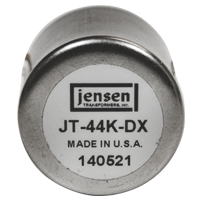 Jensen DI transformers employ multiple Faraday shields, giving them extreme immunity to hum, buzz & RF interference. The extended LF and Bessel-tailored HF responses deliver time-domain accuracy and legendary sonic transparency. Instrument loading is light as line-level signal is converted to mic-level. Step-up transformers (SUTs) match low-output moving-coil styluses to standard phono preamps. Jensen's extended frequency response and time accuracy produces legendary sonic transparency while Faraday and double magnetic shields gives them immunity to hum and RF interference. Various models available.